Tomatoes are the favorite American vegetable for the home garden. Rich in vitamins A, B, and C, tomato varieties are available to produce fruit from early season until frost. Tomatoes are easy to grow. Even a few plants will produce plenty of fruit for eating fresh, canning, freezing, pickling, or making into chili sauce, ketchup, juice and paste to use all year around in cooking. Tomatoes are either determinate (D) or Indeterminate (I). Indeterminate plants continue to grow and produce fruit as long as the weather permits. Determinate varieties grow to a predetermined size and produce their fruit during a short time period. The letters that you see on tomato tags represent resistance to a common tomato problem. These letters only note the resistance of the plant. Soil & Fertilizer Tomatoes require a well-drained soil and a sunny location. When transplanting, set the plant deep in the ground and water immediately. Throughout the growing season, provide an even supply of water to your tomatoes. Water is best provided early in the day and below the foliage level to avoid the foliage and fruits remaining wet overnight, which can encourage disease. Each week, plan to provide 60 gallons of water for every 100 square feet of tomatoes grown. Regular applications of a fertilizer labeled specifically for tomatoes will increase yields. Like peppers, tomatoes will produce more foliage than fruits in response to a high nitrogen fertilizer. To insure the quality of your harvest, it is important to be providing a tomato specific fertilizer as soon as fruits begin to form. Water Keeping your tomatoes uniformly moist will provide the best results. Water the tomatoes well just before transplanting and try to choose a shady day. This minimizes the initial water lost from the plant to the soil. When watering, avoid getting the foliage wet to discourage disease. Spacing Determine plant spacing based on your growing method. Free growing will require the most space per plan; allow three to four feet between plants in all directions. Caged plants will also require a lot of space with approximately four feet between plants in all directions. Staked plants can be grown in a tighter spacing, 18 to 30 inch spacing in rows three to four feet apart. Brandywine 80-90 10-16oz Large, flat-round shape. Heirloom. Inderterminate. Better Boy 75 8oz VFNA Popular variety with good flavor, high yielding. Indeterminate. Celebrity 72 8oz VFNT Firm, excellent flavor. Determinate. Early Girl 52 4-6oz One of the earliest tomatoes. Indeterminate. La Roma 76 5-8oz VFNA Large Roma tomato, vigorous plant. Determinate. Lemon Boy 72 7oz VFNA Lemon yellow, mild flavor. Indeterminate. Mega Bite 62-68 4-6oz Compact plant, good in containers. Determinate. Patio 70 4oz FA Good for containers. Determinate. Peardrops 62-68 1oz Sweet yellow fruit, good for containers. Determinate. Reambling Series 62-68 1-1.5oz Vigorous trailing plants with striped fruit, good for baskets. Determinate. Super Fantastic 70 10oz VFN Solid, meaty fruit, high yields. Indeterminate. Super Sweet 100 65 .5-1oz VF High yield of small, sweet cherry tomatoes. Indeterminate. Sweet Baby Girl 65 1oz T Produces 1 oz sweet cherry tomatoes, high yields. Indeterminate. Sweet Olive 57 .5-1oz Grape tomato, high yields, sweet. Determinate. Tumbling Tom 75 1oz Sweet cherry tomato, good for baskets, high yields. Determinate. Tumbling Tiger 62-68 1-1.5oz Oval-shaped, striped cherry tomato, good for baskets. Determinate. Window Box Roma 70 2oz VFT Paste tomato, compact plant, good for containers. Determinate. Yellow Pear 75-78 75-78oz Pear-shaped yellow fruits, vigorous. Heirloom. Indeterminate. Tomatillo Toma Verde 75 2-3oz Mexican husk green tomatoes, early, flat-round fruit. Indeterminate. Learn how to avoid this environmental disease. Blossom End Rot is an environmental disease caused by improper watering or by a calcium deficiency when fruit is forming. The disease can be caused by several other factors as well. It most often occurs when plants are grown under favorable conditions in the early part of the season and are then subjected to a long period of drought while the fruit is in the early stages of development. Under such circumstances, the cells at the end of the blossom fail to receive sufficient water to grow. Blossom end rot can also occur after a period of heavy rain, because many small rootlets die from lack of aeration in the soil. Overdoses of nitrogen hinder the uptake of calcium, a situation which aggravates the problem. Blossom end rot could also be caused by excessive root pruning, which results from heavy cultivation near the plants. Pepper – Light-colored, sunken, water-soaked spot near the blossom end of the fruit. A third of the fruit may become shriveled. Tomato – Sunken, dry, brown to black leathery spot develop near the blossom end of tomatoes. Control Strategy Water plants evenly (consistently) and only as needed. Check the pH of the soil: It should be between 6.0 and 7.0. If it’s below 6.0, add horticultural lime, which contains calcium. Also calcium containing sprays such as Rot- Stop from Bonide could be used to treat the plants. Prevention Avoid adding surplus nitrogen, and be sure to apply ample amounts phosphorus and horticultural lime. Water plants consistently and evenly throughout the season. Cultivate the soil as little as possible in dry weather to avoid further drying of the soil, and be careful not to damage roots during cultivation. Test for and correct calcium deficiency. Herbs are among the easiest plants to grow and enjoy. An herb garden, even a single pot on a patio or windowsill, can yield fun and add flavor to your cooking. Herbs provide flowers, fragrance, flavor, and better health. Herbs can be classified as annuals, biennials, or perennials. Annuals bloom one season and then die. Biennials live for two seasons, blooming the second season only. Perennials bloom each season once they are established. 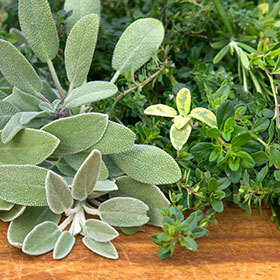 Light Some herbs grow well in partial shade, but most need full sun for at least six hours a day. Growing plants in portable containers will allow you to move them if you don’t have a fixed spot with enough sunlight. It also allows you easy access for harvesting when cooking. Soil & Water Herbs appreciate good drainage and an evenly moist soil. Drainage is probably the most important single factor in successful herb growing. None of the herbs will grow in wet soils. Perennial and biennial herbs should be winter protected. Mulch after the ground has frozen in early winter. Harvesting Fresh leaves may be picked as soon as the plant has enough foliage to maintain growth. Pick leaves or seeds after the dew has disappeared but before the sun becomes too hot. Wash dirty leaves and seed heads in cold water; drain & thoroughly before using. For the most part, the more you harvest herbs, the more they will produce. When you don’t pick your herbs often enough, they tend to go to seed or become bitter. Bringing Herbs Indoors Extend your herbal gardening season by bringing your herbs indoors. Annual herbs can spend their full life cycle in a pot indoors. Perennial herbs, however, will do better if you place them outdoors during the summer. When transplanting herbs into pots, cut them back to make them easier to work with and encourage new growth. Place your herbs in a sunny location and keep them evenly moist. Learn the do’s and don’ts of veggie gardening. Water and Fertilizer Add a veggie specific fertilizer during the growing season or use a well balanced 10-10-10 (1 lb per 10 sq ft) mid season when plants are established. Water your garden every day in hot weather. Mulch around plants when soil warms up to prevent water from splashing on the foliage and causing blights and fungal disease. Planting marigolds around the edges will help control aphids, discourage bunnies and will make it look better. Location and Size Pick a sunny spot in your yard. At least 6 hours of sun. Make a garden only as big as you can tend. 10 x 10 ft is a good starter garden. Build Your Garden Add as much organic matter as possible. Add a 2″ layer of compost and manure and spade your soil 12-18″ deep. Break any clumps. Level with rake. Decide what veggies to grow. Consider flavor, fruit size, yields and time to producing fruit (MN summer is short). Separate your garden into beds for the different veggies—consider plant size, spacing, growing habit (support). A chicken wire fence around the garden may be helpful if there is a bunny problem. Timing Start your seeds indoors March-April depending on package instructions or purchase ready to plant in your local garden center. Cool crops like lettuce, cabbage, and broccoli can be started in mid April weather permitting. All frost sensitive crops cannot be planted outside until after Mother’s day (or Mid May).